▷ Best Auburn hair with highlights 2019 ¡Photo ideas & step by step! 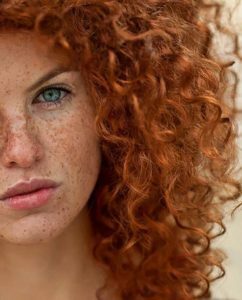 When we think about Auburn hair, all that comes to mind are those fiery girls with beautiful skin a freckles all over their beautiful faces, but the truth is that auburn hair has a wide variety of shades and tones that it can become difficult to pin point just one of all this beautiful gamma of reddish hair colors. 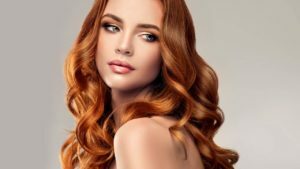 Auburn hair is defined as a reddish-brown in color or dark ginger, it can range in shades from medium to dark and it can be found on a wide range of skin colors and any eye color, but like every other red colored hair, it is associated with light skin. And if you want to give it a change of look while not going completely over board with it, then highlighting it can be the perfect solution for you. Finding the right shade to highlight your hair can be a difficult task, but remember that is why you have your stylist, that besides helping you apply the highlights the way you want, they are also there to guide you along the way and help you find the right shade for your base auburn shade. Do not be afraid of making this change, a change of look can boost your happiness and confidence, and all of this by just getting out of the ordinary and start reinventing yourself. Also, remember that if you put your hair in the hands of professionals that know how to do the job, the risk minimizes and also taking it will be worth it for all the possibilities that are laying right in front of your eyes. Renewing your look with an auburn mane covered by highlights is a splendid idea to light up and frame your face instantly. If you want to dye your hair, but are too afraid to do a complete change of look and want something subtle or maybe something little to start with, highlighting is your greatest choice as it will give you a change but not one that is too drastic. And if you do want a bigger change of look then all you have to do is ask for thicker and brighter highlights, they will be more noticeable and will lighten your face even more. 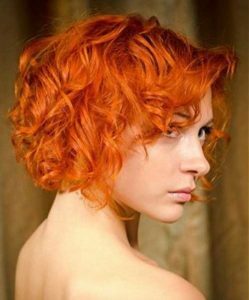 You can find many techniques and methods to get beautiful highlights in your auburn hair; the important thing is choosing the right tone ­–that way, the difference between your base color and the dye looks natural) and the thickness of the reflections. If you are looking for a bigger change, then try thicker strands specially at the top of the head and in the zone of your bangs. On the other hand, if what you are looking for is a subtler change then adding just a few highlights that are just one tone lighter than your base color you will technically have the same hair color but with and extra of luminosity. 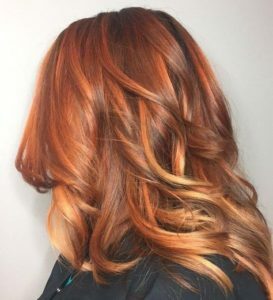 With auburn hair staying in the warm side of the scheme is a great idea as you won’t have a big contrast between your base color and your highlights. So caramel highlights are a great idea at the moment of looking for a change of look in your natural hair color. They will add dimension and brighten out your face and hair to make it look with more movement and it could even get to make it look healthier! 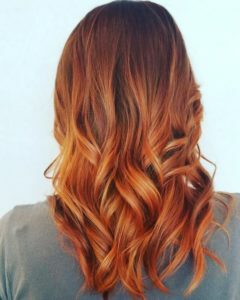 Caramel is such a rich and eye catching color that if you mix it with your auburn hair will make everyone turn their heads every time you walk into a room. When it comes to adding highlights to highlighting your auburn hair, you may think that you know how the end results will look like because when you think about it, you will only think about your hair with lighter strands, but the truth is that there are so many different ways to add highlights to your hair that at least one of these is ideal to make the change that you have always wanted for your hair. 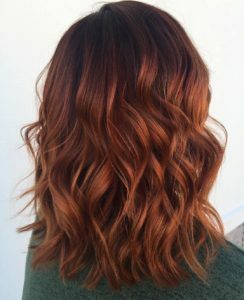 Auburn hair with caramel highlights is a look that a lot of girls go for in the fall, and you already are one step forward as you will not have to dye your whole hair. 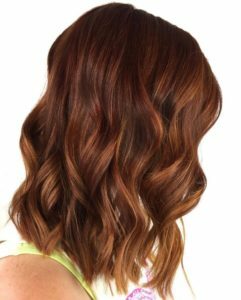 Just like auburn hair, caramel has a variety of shades that can fit perfectly with your auburn hair when you need it to be. 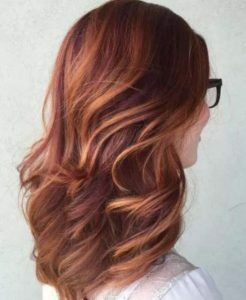 If you have a light auburn hair then going for a light shade of caramel will make your hair look like the sun, or maybe try adding another color with the caramel highlights, like for example blonde highlights, the mixture of these two colors will make a great look by their contrast and definition to your beautiful mane. Going slow may be the perfect thing for you if this is the first time you are dyeing your hair, especially if you do not know what decision to make at the moment of choosing what color for your highlights. 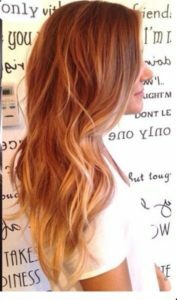 You will look beautiful with this exact tone of caramel as it will make you have a change of look but not one that is too drastic, less is more they say. And your hair will look amazing no matter what time of the day it is. When you have auburn hair, you can expect for people to consider that it does not need any change and that it looks good naturally, but the truth is that you should do what you consider good for your, either changing your look or not it is your hair and it is your choice. No matter what shade of auburn your natural hair is, you can be sure that it will have an extra wow effect when you add golden highlights to it. Just imagine how cool and fun your hair will look like when you add the highlights in certain parts of your hair. 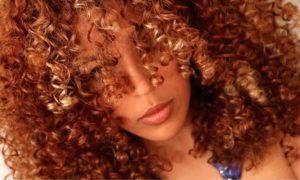 This can be perfect for you if your hair is curly, although it of course can also work for women with straight hair, or something in the middle. As we have told you through all this article, there are plenty of options for your golden highlights, you just need to know which shade will work the best with your auburn hair so the change will be a success. Golden highlights in auburn hair is one of the most common applications used worldwide, since gold is a warm color that with auburn hair will look amazing and will be an easy way to have that change of look. The discoloration plan is quite simple, you only have to decolorize your base color in the sections that you want to place your golden highlights, for an approximate time of 20 minutes, it is very important that you do not leave it for longer than 35-40 minutes, and then you just have to apply the golden dye of your preferred brand. Blonde highlights are a big statement when you decide to apply them to your auburn hair. This is a statement look and it reflects style as you are taking a big change when adding them to your hair. This is no look for you if you want to go for a subtle change as this is a big contrast from your auburn hair, it will be noticeable from faraway and you will look amazing with them. For this look you need to take into consideration how dark is your hair and if it has been dyed of not. If it has not been dyes before, ergo a virgin hair, will only need a discoloration of no more than 20 minutes, but on the contrary hand, if your hair has been dyes before then the discoloration can take up to 30 or 40 minutes. You should also take into consideration the time of realization. Many stylists recommend doing the discoloration and coloration processes separately and in a time of 5 to 6 days to end up with healthier hair that you would end up with if you did the whole process in just one sitting. If you wait after the discoloration process for a week or more, then your hair will have recovered from this process and the damages that it produces. Your stylist should be aware of these problems and preventions of damaging your hair, and this will keep your hair healthy and great looking. 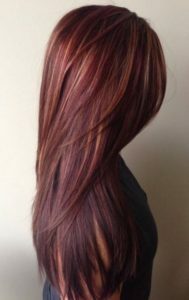 If you are liking these Auburn hair with highlights learn how to do them here! 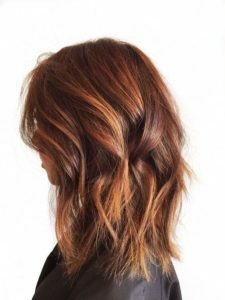 So we have told you a couple possibilities to what colors you should highlight your auburn hair with, but here we are going to tell you how to make them by yourself or even with your friends! We are not, by any change, telling you that you should do them at home actually we completely recommend that you go to a stylist and let them do the job for you. Not only it is easier for you as you will have someone else do the job for you, but you can also be sure that the end results will be fabulous and make you look amazingly. But if you find yourself not having enough money or time to go to a salon then we want you to be able to have the better results you can have when doing them at home. 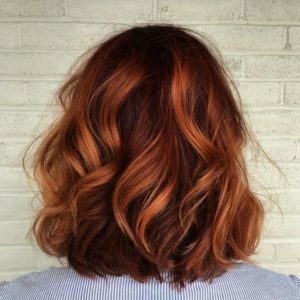 The first step should be choosing the color you want to work with as well as choosing what method you want to use on your hair. We have told you a couple shades to use on your auburn hair but do not close yourself to those options, you can search and see which one will fir better for you. 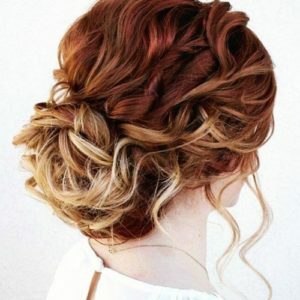 Then prepping your hair, once you have decided what kind of highlights you want to use on your hair it is moment for you to start applying the decolorizing to your hair on the strands that you want to highlight, be careful and try to apply it with sweeping motions and then combing your hair to make it look more natural in the end. Once you have let the hair decolorizing from 20 to 40 minutes, you now can rinse it with plenty of water and some shampoo. We recommend for you to decolorize your hair one day and wait at least 5 to 7 seven days to apply the hair dye. Enjoy your new hair style! Now you have your new highlights and are ready to show them to your friends and family. Sometimes after dyeing your hair, what It needs the most is to be hydrated thanks to the harsh treatment of the decolorizing, we advise you look for intensive conditioning products for dyed hair. In addition to the hair masks, we recommend you use a heat protector, especially if you desire that your highlights last the longest possible time, you should protect it at all times that you expose them to high temperatures when you use the hairdryer and the iron. Do not forget to retouch your highlights, it is important and we recommend for you to retouch them every so often, maybe every 6-7 weeks. Stablish reminders, it is easy to become busy by our everyday lives and forget to do a retouch.